A pure, intense minty-and-green delight. The 70% dark chocolate topping wraps everything together to make a delicious sweet treat. Expect an After Eight experience! Suitable for vegans. Refined sugar free, gluten free, wheat free, dairy free. Comes as a pack of 6 or a pack of 12 slices - use the option to choose. Handcrafted by Raw Bake Station, an artisan bakery that specializes in creating every-day sweet treats, but as healthier alternatives to the many sugar-filled snacks found on the shelves today. 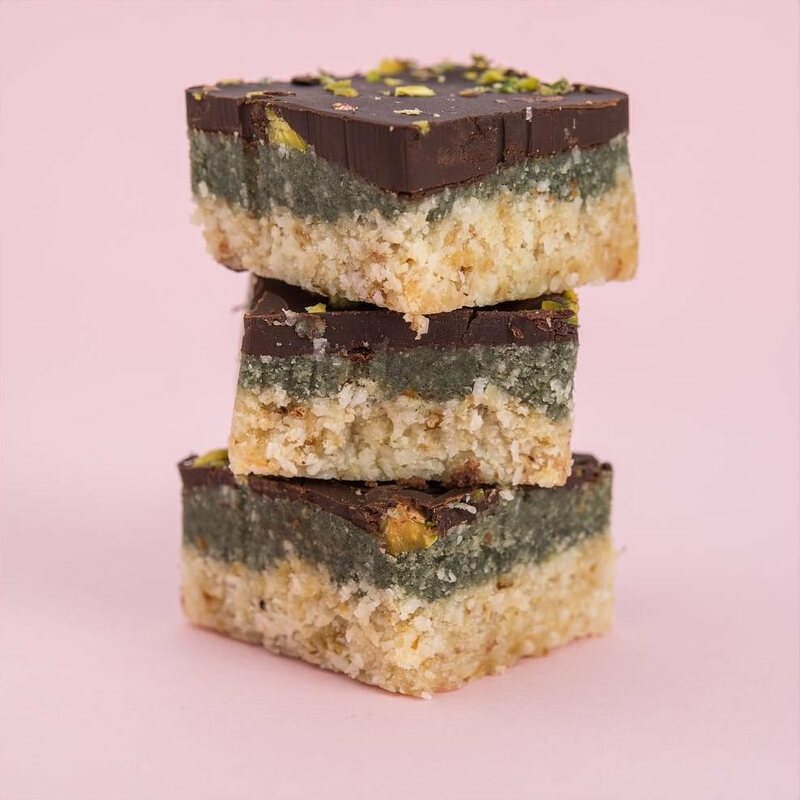 As an exclusively all-raw bakery, they pride themselves on unique and never-seen-before creations and tastes that haven't been experienced! Yet, anyway. Keeping the ingredients raw helps to retain their nutrients, so is thought to be more beneficial. All of their products are thoroughly free of refined sugars, gluten, wheat and dairy - as well as being created from delicious, natural and raw ingredients! They make a perfect guilt-free treat suitable for anyone; whether vegan, or for those who wish to eat healthier and reduce their sugar intake, these treats and desserts can fill the void. Please refrigerate upon arrival. Minimum shelf life: 4 weeks. Ground Almonds, Desiccated Coconut, Dates, Maple Syrup, Coconut Oil, Coconut Butter, 70% Dark Chocolate, Pistachios, Vanilla, Spirulina. The best treat without sugar!!!! wow what a treat! The best dessert on the market! I highly recommend these little treats. You will not be disappointed.